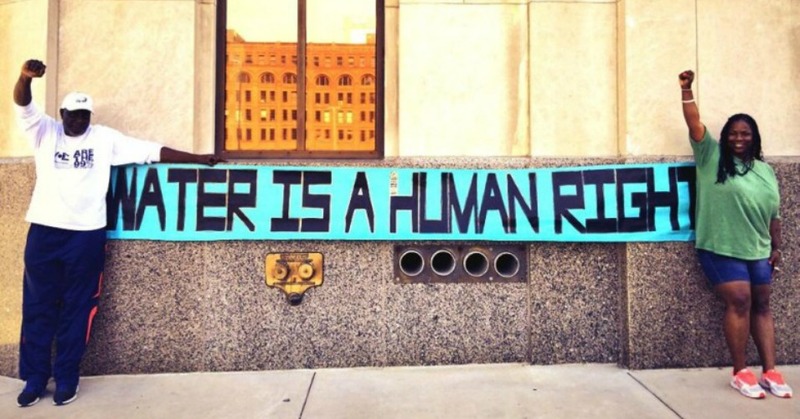 Rallying on the steps of the Michigan governor’s office in Detroit, activists and religious leaders on Monday called for an immediate moratorium on the city’s plan to shut off water to tens of thousands of households. “This is everybody’s fight, water is a human right!” the protesters chanted. In recent weeks, activists in Detroit have mobilized against the city’s efforts to cut off the water supply to 120,000 delinquent accounts, or over 300,000 city residents. News of the shut-offs has spread following a statement issued last week by the United Nations that the city’s plan “constitutes a violation of the human right to water.” Now, with Detroit under the media microscope, activists are hoping that the state government halts its plan to deprive residents of this essential human right and instead adopt an affordable payment plan based on an individual’s income. “The whole world is watching what is happening here and how Detroiters and their allies are responding to this human rights violation,” the DWB continued. From June until September, the Detroit Water and Sewage Department (DWSD) will be cutting off citizens’ water supply at a rate of 3,000 per week. According to the department, 4,500 households have already been turned off. Further, in the past ten years Detroit residents have seen water rates rise by 119 percent with the city council just last month approving an 8.7 percent rate increase. Many believe the rate hikes and imminent shut-offs are an attempt by Detroit Emergency Manager Kevin Orr to make the DWSD more appealing to potential investors in a bid to privatize the city’s utilities.